From left, Bossier City Mayor Lo Walker (Louisiana Tech, Business Administration 1956), LQHBA scholarship winner Hunter Fertenbaugh, LQHBA Board members Jimmie Hatcher and JoBaya Foreman, and LQHBA scholarship winner Faith Mcfadden. (Not pictured: LQHBA executive director Tony Patterson (Tech, Business Administration 1985). Louisiana Tech junior Faith Mcfadden and future Bulldog Hunter Fertenbaugh, a senior at Northwood High in Blanchard, recently won $2,000 scholarships from the Louisiana Quarter Horse Breeder Association (LQHBA). 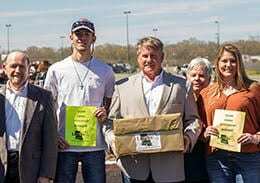 The scholarships were awarded at Harrah’s Louisiana Downs in Bossier City after Hh Gailforce won the Mardi Gras Futurity and Tdz Louisiana Toast won the Mardi Gras Derby. The afternoon featured the first opportunity of the year for eligible Louisiana students to receive scholarships from the LQHBA Scholarship Fund. Random drawings are held several times each racing season at tracks around the state; more than $570,000 has been earmarked for this program since its inception in 2001. From Keatchie and a graduate of Logansport High, Mcfadden is a junior kinesiology health science student. Fertenbaugh came to the races with his mom “to enjoy the day” and left with a scholarship he’ll use in the fall. “I’ve chosen to come to Tech because it’s not too far away from my family and because if offers one of the best engineering programs in the state, if not the country,” Fertenbaugh said. “I plan to major in mechanical engineering because I love working with moving parts and designing things so they’ll be stronger than they were before.